Big Changes @ Monaghan Libraries! We are introducing more big changes in the library service in County Monaghan. On Thursday 2nd March, all libraries in County Monaghan will open their doors using the new national library computer system. Libraries Ireland is a government-sponsored initiative providing ready access to the library stock of all public libraries in Ireland. So what does this mean to you the customer – first of all you will have access to all the books and stock from all 344 public libraries in Ireland, which is over 10 million items!! Wow…. You will be charged a fine of 0.05c per day per item not returned or renewed on time. You MUST have your library card with you every time you visit the library to borrow books or use the internet as library staff will have limited access to borrower accounts. By the end of March, you will be able to use your Monaghan Library card in other Irish public libraries. Please bear with us while staff and yourselves adjust to availing of the expanding resources from this new system. If you need any further information on this, please do not hesitate to email moncolib@monaghancoco.ie or contact 047-74700. 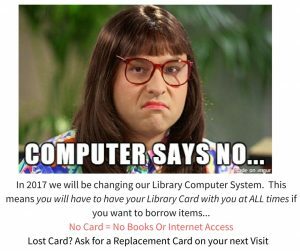 *Please note you may only access your account if you have your Library Card Number and a PIN number. You can obtain your PIN from Library Staff.